Take fried eggs on toast to a whole new level with our recipe using feta and homemade onion jam. The sweetness of the jam contrasts the creamy saltiness of the melted feta perfectly. Best served with buttered, toasted sourdough. For the onion jam, heat the oil in a wide, deep saucepan, then add the onions and a generous pinch of salt. Cover with the lid and cook on a low heat for 10 minutes until softened. Uncover the pan and turn up the heat to medium, then cook the onions for 25 minutes, stirring now and then, until caramelised. Add the spices and a good grind of black pepper. Stir for a minute, then stir in the sugar and vinegar and cook for about 10 minutes until the sugar has melted and the liquid has reduced and looks syrupy. Heat the oven to 220°C/200°C fan/gas 7. Heat a glug of oil in the ovenproof frying pan and crack in the eggs, fry for 1 minute on a high heat, season with salt and pepper, then spoon a quarter of the onion jam over the eggs and sprinkle with the feta. Put the pan in the oven and bake for 2-3 minutes until the whites have set and the yolk is cooked to your liking. 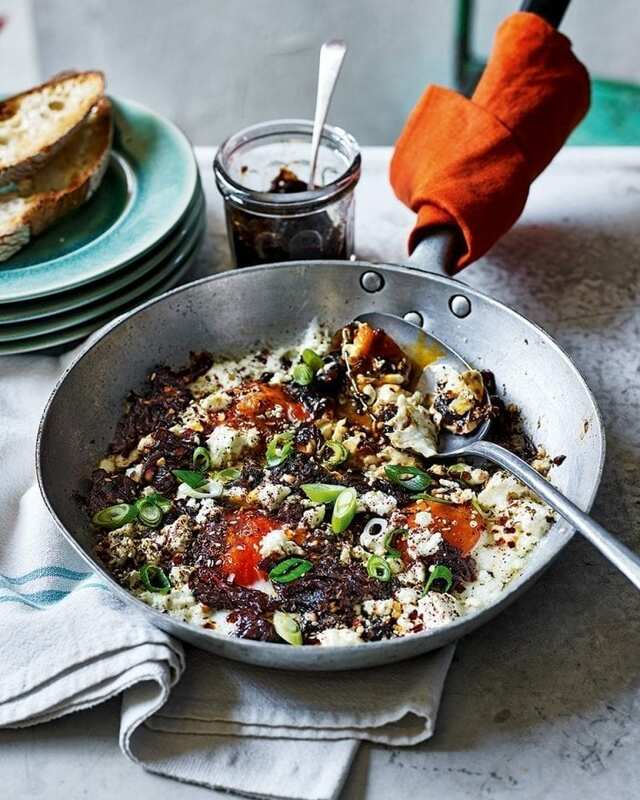 Meanwhile, toast and butter the sourdough and serve the eggs in the pan (wrap the hot pan handle in a clean tea towel), sprinkled with the za’atar, spring onions and chilli flakes. This makes more onion jam than you need but it’s excellent with cheese on toast. Put the remainder in a clean jar and keep in the fridge for up to 1 month.